​More people are going to be traveling this Thanksgiving holiday than in the past dozen years, according to AAA. That's 1.6 million more travelers than last year, for a total of 50.9 million Americans hitting the roads, skies, rails, and waterways. 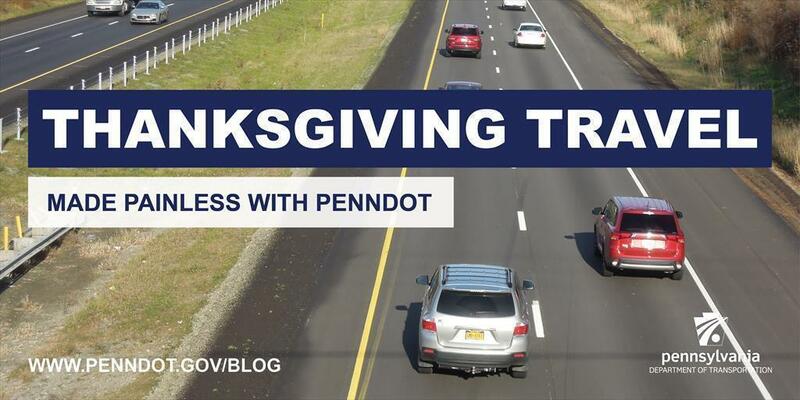 As in years past, PennDOT wants to help make your Thanksgiving travel on state roadways as painless as possible. Thanksgiving travelers should check out our Historic Holiday Traffic page on 511pa.com, which allows users to see how traffic speeds on the Wednesday before and Sunday after Thanksgiving in 2015 and 2016 compare to traffic conditions during a typical, non-holiday week. Use this tool to decide the best times to travel during the holiday. 511PA also offers real-time traffic speed information for nearly 2,900 highway miles across the state, in addition to winter road conditions, construction and road incidents, and even weather forecasts. Speaking of construction, PennDOT will be removing lane restrictions and suspend construction projects wherever possible through the holiday period. Use 511PA.com to see the remaining closures. PennDOT's traffic management team analyzed our holiday data to identify locations and timeframes across the state where congestion typically increases dramatically. Using this data, we'll take steps to try to alleviate congestion and improve safety. Increase the hours that PennDOT's State Farm Safety Patrol will be on duty and patrolling this section of highway. In the Philadelphia region, staff identified I-95 in Delaware County, I-76 (Schuylkill Expressway), and U.S. 202 and 422 near the King of Prussia Mall and the Philadelphia Premium Outlets as target areas. To assist with quick incident and shoulder clearance, the department will increase the hours that PennDOT's State Farm Safety Patrol will be on duty. Alert motorists of traffic conditions with highway advisory radio, electronic message signs and the 511PA service. PennDOT tunnel maintenance staff will patrol 16 miles of I-376 on Saturday.